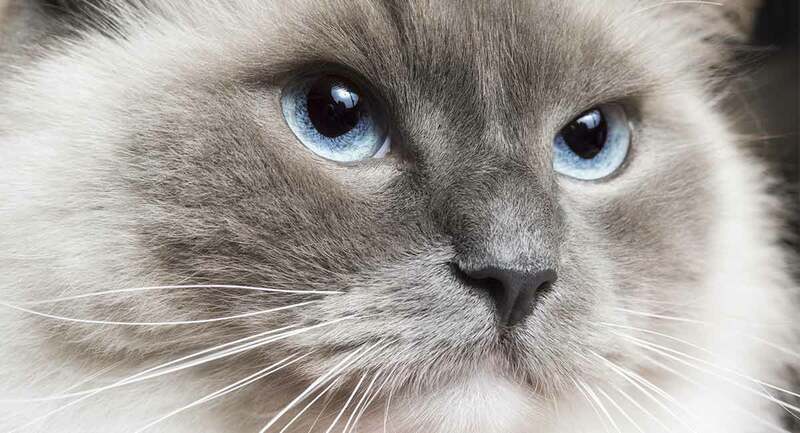 It can often come as a surprise to new Ragdoll cat owners that the best food for Ragdoll cats might be different than the best food for other cat breeds. After all, cat food is cat food, right? Today, there are so many different choices for Ragdoll food, including Ragdoll kitten food and Ragdoll adult cat food. In this short, focused article, we will introduce you to some of the best food for Ragdoll cats. These recipes will help you meet your Ragdoll cat’s unique nutritional requirements in kittenhood and adulthood. The best food for Ragdoll cats can change as your cat moves through life. Ragdoll kittens are generally quite active and playful and can expend quite a bit of energy throughout the day! In adulthood, most Ragdoll cats are starting to settle down, even to the point of preferring to stay nearer the floor rather than climbing and exploring high spaces like many other cat breeds. Because of this, and also because the Ragdoll cat’s long, silky fur can easily collect dust and debris outside, many Ragdoll cat owners prefer to keep their cat indoors. But this also means your Ragdoll – a sizeable breed to start with that can reach 25+ pounds in adulthood – will need extra play and a carefully measured diet to avoid feline obesity. Choosing the best food for Ragdoll cats can really help keep your cat healthy throughout life! Because cats in general are obligate carnivores (evolved to eat pure protein diets), simpler cat food recipes typically work best to maintain your cat’s overall health and wellbeing. These brands offer some of the simplest and best dry cat food for Ragdoll cats! You can’t help but feel confident when the cat food is formulated specifically for the Ragdoll cat breed, which is something Royal Canin happens to do especially well. This dry Ragdoll food comes highly recommended by Ragdoll breeders and owners. As a bonus, the kibble is bigger to make it easier for your larger-jawed Ragdoll cat to grasp and chew. This simple, limited ingredient recipe dry cat food comes highly recommended by Ragdoll breeders. After the first few ingredients, the remainder of the recipe focuses on vitamins, minerals and nutrients to supplement your cat’s immune system heath. This highly rated grain-free indoor cat food is free from grains and other known allergens and comes in several recipes for indoor-only cats. 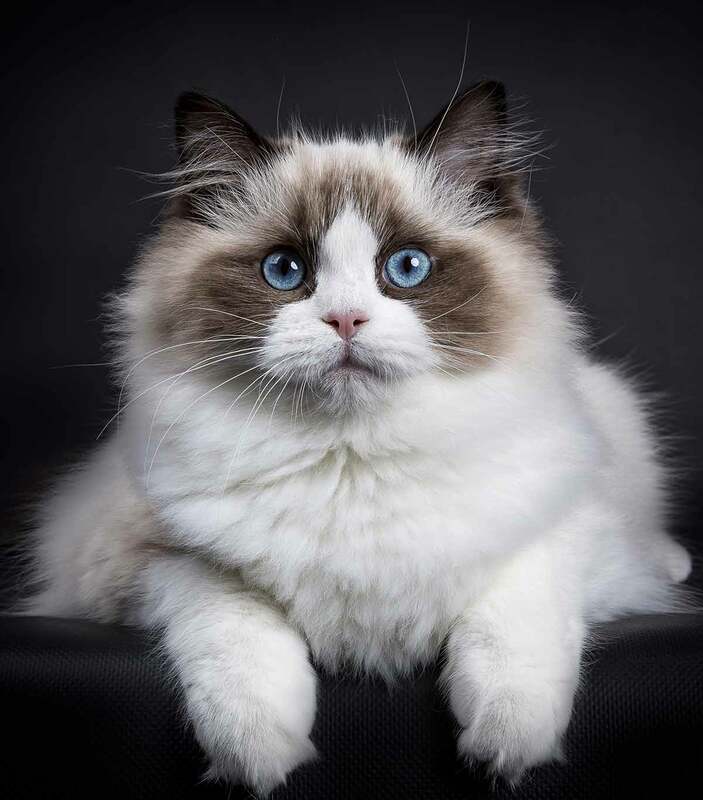 The nutrient balance is designed to support the health needs of larger cat breeds with lower activity levels like the Ragdoll cat. Wet cat food can be an important part of your Ragdoll cat’s diet. It is highly palatable and contains more moisture, which is ideal for when your cat is not feeling well to avoid preventable, dehydration-related kidney failure. Wet food can also make for a great training treat! These brands offer some great options for the best wet food for Ragdoll cats. This balanced adult cat food by Hill’s proves that wet cat food can be delicious without packing on the pounds. This is a popular wet food choice with Ragdoll cat breeders because it can help keep your cat hydrated and slim. This breeder-recommended wet flaked food is gluten-free and is free from corn, soy and artificial flavors. It makes a perfect stand-alone meal, accent to dry kibble or treat food. You can choose from several recipes to keep your cat’s menu interesting. This grain-free natural wet cat food is recommended by Ragdoll breeders for its pure protein-based recipe full of real whole food ingredients. Choose from several recipes to keep mealtime for your Ragdoll creative and tasty. Ragdoll kittens, like all kittens, need a daily diet that is formulated with a kitten’s higher nutrient and calorie needs in mind. These brands are worth considering as you select the best food for Ragdolls as kittens. Ragdoll kittens will spend the first year or so of life developing their gastrointestinal system and “putting the internal house in order” so to speak. It is especially important during this time to ensure your Ragdoll kitten’s diet is pure and free from potential allergens like wheat and grains. This food comes highly recommended by Ragdoll breeders for its pure-protein, nutrient-enriched formula. Royal Canin’s Mother & Babycat food can help your Ragdoll kitten put down a firm nutritional foundation for a strong immune system and GI tract development. This food is designed to be highly digestible and is packed with essential nutrients and prebiotics. The kibble is nice and small to make it easy for your kitten to grasp and chew. This highly recommended dry kitten food is a favorite among Ragdoll cat breeders for kittens aged at least 8 weeks and up to 12 months old. Be sure choose the Indoor Kitten formula if you’re keeping your cat inside. We hope you have found this guide to the best food for Ragdoll cats helpful and informative as you choose the best food for your precious fur baby! Remember, it is always a great idea to involve your cat’s veterinarian in this process as well, especially if you are having a hard time deciding which food to try. Does your Ragdoll cat have a favorite food or treat? Did we mention it here? Please drop us a comment to let us know – we love to learn from our readers! Hamilton, N., “Products We Recommend,” Angel Girl Ragdolls Cattery, 2018. Beal, L., “Ragdoll Cat Care & Feeding,” Lions Royal Ragdolls Cattery, 2014. Arthur, G., et al, “Feeding Your Ragdoll,” Darlin’ Lil’ Dolls Ragdoll Cattery, 2018. Walker, L.H., DVM, “Your Ragdoll – Breed Info,” Coats Veterinary Clinic, 2018. Willette, B., “WilletteRagdol Kitten Wish List,” WilletteRagdol Cattery, 2018. My ragdoll cat and kittens have never liked hills science diet wet cat food and I’ve tried to introduce it in many different ways. They do like hills dry cat food in different varieties. They love purina fancy feast of all sorts and plain old friskies wet cat food. They have 100 percent clean health checks from my vet each year. So feed them what they like. Sometimes I cook them a chicken breast or a piece of fish. I had the same issue with Vet recommended wet and dry foods for my Ragdoll who is now a male 13 month old, who was found in a friends backyard with no mother in sight at about a month old. I am use to mixed domestic tabby type cats so this Large Breed is really been a learning experience. We exercise him A LOT, but he is still getting fat. I have asked the Vet numerous times for help, but he is so popular here in Burbank CA that you can’t get an answer by email or even in person (you mostly just see the Vet Techs who make you feel stupid if you ask any questions) except the same stupid response over and over: feed him the Hills wet/dry food which the cat tries to bury like poop anytime I tried to feed him either. I have had some success with the Blue Wilderness Grain Free Dry/Wet Foods but I don’t know how much in ounces to feed each day of either. Would love to know how much wet/dry food anyone out there feeds a large male year old Ragdoll to maintain or even lose a bit if weight. Any help, anyone? My ragdoll is 11 months old we feed him royal canin veterinary care neutered male wet and dry food. We generally mix them together he doesn’t like the dry food too much. If they have been neutered we have been advised to feed him this special type of food cos it is low calorie. We only feed him 1 1/2 pouches of wet with about 30g of dry throughout the day. We have him checked and he is at a good weight. Joan, I don’t know how much you’ve read about Ragdolls but male Ragdolls can easily get to 20 lbs! They also continue growing for 2 years! In fact, it can take up to 3 full years to fully develop their coat, color & size. Our breeder, who is one of the finest in the country, told us that it is normal for Ragdolls to carry some belly fat and that we should not let our vet tell us we should put them on a diet. So you need to decide if he is really getting fat or is he just a healthy growing boy. We have six month old sisters & they are already 7 lbs. Good luck & I know you’re going to really love this guy & how blessed to have found him! i adopted a male rag, who I’ve had since late January. He is now 11 months old. He had some kind of allergy and scratched all his ruff off. In fact, down past his shoulders, it’s now very short. Not bare, just lacks fluff. Tried antihistamines, change of food, no difference. Any suggestions other than steroids? My year and a half male Rag doll has bladder crystals. It breaks my heart to see him in pain.